Skidmore’s board has been moving and shaking recently, with the transition to a new chair and several notable campaign gifts. 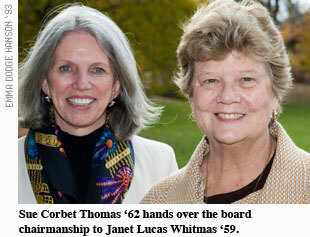 The first trustee meeting of the 2008–09 academic year, in late October, featured a fare­well to outgoing chair Suzanne Corbet Thomas ’62 and a welcome to Janet Lucas Whitman ’59 as the new chair. A campuswide reception and a trustees’ dinner were held to honor Thomas’s nineteen years of board service, including the past six years as chair. A group of colleagues, friends, and classmates created an endowed $300,000 fund that builds on her support for the Arthur Zankel Music Center, slated to open in 2010. In 2007 she and husband Charlie made a campaign commitment of $1 million toward the new center and in particular to name its outdoor performance space, the Thomas Amphi­theater. 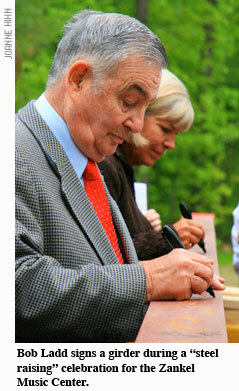 The new fund in her honor will un­der­write ongoing operations and an annual concert at the Thomas Amphitheater. 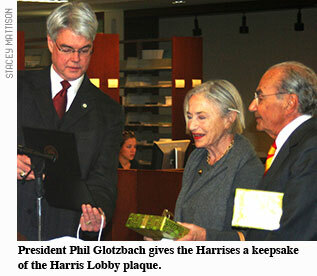 The board cited Thomas’s “commitment, guidance, clarity of thought, and diplomacy” as an alumni volunteer and trustee. Thomas says she made lifetime friends in her very first hour as a Skidmore student—an instantaneous bond that’s grown steadily stronger over her years of service to her alma mater. Trustee Donald Sussman and his family have committed $12 million as a lead gift toward new student residences to replace the aging Scribner Village apartments. Sussman is the parent of Emily ’04. An earlier gift supported the vegetarian station, named Emily’s Garden, in Skidmore’s dining hall. President Philip Glotzbach called the new gift “a welcome vote of confidence,” particularly in a financial climate when major projects will be a challenge for Skidmore to fund. Sussman said, “Now, more than ever, it is im­portant to show support for those institutions that make a difference in the world…. I hope that this new facility will be an important part of student life at Skidmore for many generations to come.” Glotzbach confirmed, “This is a project that we have needed to move forward for some time, and there is no question that we could not even contemplate this un­dertaking without the family’s support.” The lead gift is expected to help pique the interest of other benefactors to complete the project’s funding. 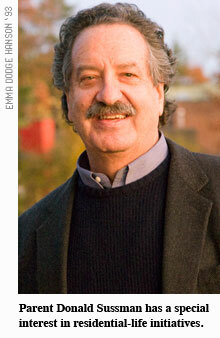 Sussman joined the board in 2004 and is vice-chair of its Budget and Finance Committee and Investment Committee. Former trustee Irving Harris and wife Selma have made a $250,000 campaign gift, and the lobby of Scribner Library has been named for them. Already the library contains a reading area named in memory of their son Jonathan ’76, who died in 1997. The Harrises are also the parents of Lisa ’79. Robert Ladd, trustee emeritus and representative of the Lincoln and Therese Filene Foundation, presented Skidmore with $1 million to support construction of the Zankel Music Center. The gift, part of a $2 million commitment from the Filene Foundation, is earmarked for the Zankel’s centerpiece concert hall, a 600-seat auditorium backed by a dramatic floor-to-ceiling window. The hall will be named in memory of Ladd’s mother, Helen Filene Ladd ’22, herself a longtime Skidmore trustee. Since the 1980s, one of the keystone buildings on the Jonsson campus has been the Filene Music Build­ing with its Filene Recital Hall, also named for her. That building, near the site of the new center, will be renovated as part of the Zankel project.